Chandra and Hubble Space Telescope images of two recently detected emitting globular star clusters - so called because of their spherical shape - were used as a cross-check to determine the position of X-ray sources near the center of the Andromeda galaxy to an accuracy ten times greater than before. 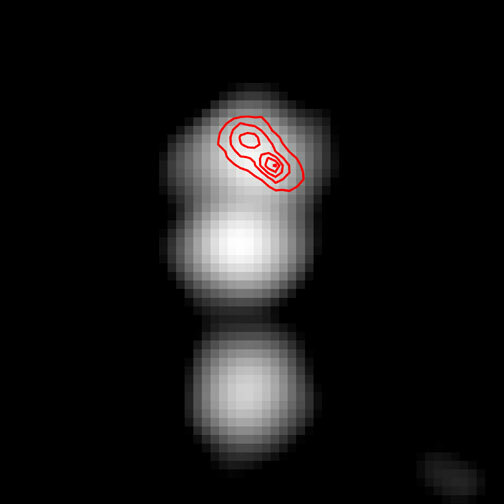 The inset shows the three Chandra sources closest to the supermassive black hole, overlaid with the intensity contours from the HST image (red). 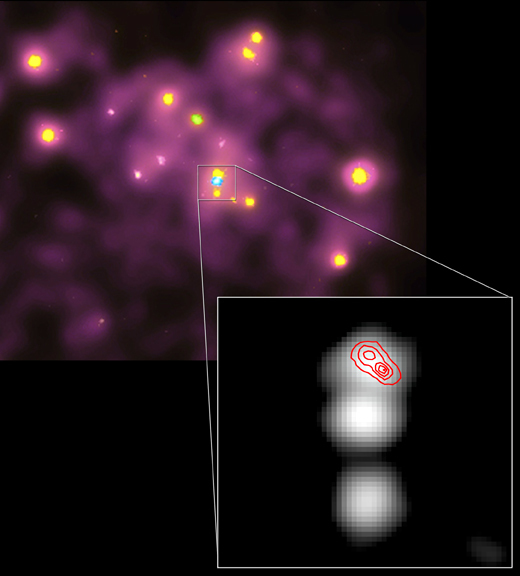 The location of supermassive black hole is thought to be in the middle of the peanut-shaped intensity contours, and very close to the Northern-most of the three Chandra sources. These highly accurate positions show that the very cool X-ray source (blue) previously identified with the supermassive black hole in the center of the galaxy is actually about 10 light years south of the center. A second, hotter X-ray source, is found to be at a position consistent with the position of the super massive black hole. The globular clusters are outside the field of view in this image.